Weird, right? Baked cucumbers? But truly, at this time of the year, when cucumbers are pawned off on friends, family, and passing aquaintances and rival zucchinis in their effusive over-supply… what have you got to lose? 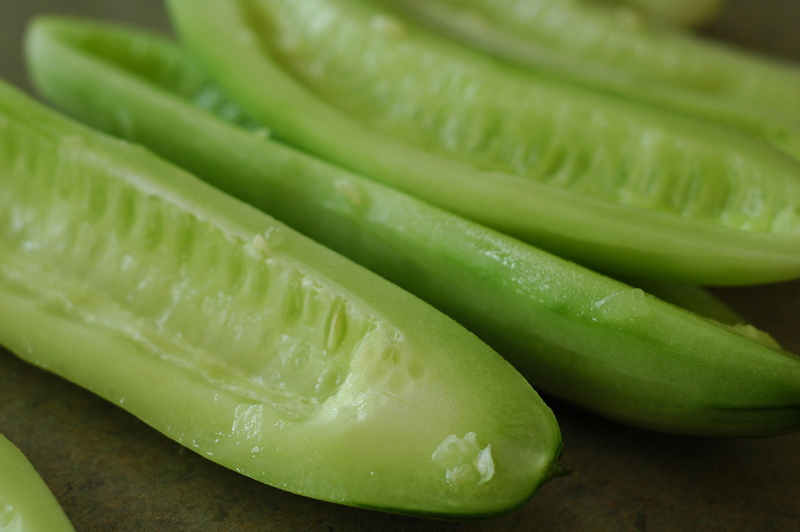 If you’re like us, you have more cucumbers than you know what to do with. Sure, they are a great snack, and make lovely salads, but frankly that tends to be the extent of their usefulness in most kitchens. Which is perfectly acceptable most of the time, except when you have 13 cucumbers crowding out the fridge space, at least all the fridge space that isn’t taken up by zucchini. So if I were to tell you that you can bake them in a simple butter sauce and they are delicious, what would you have to lose in giving it a shot? If you’re like me, nothing. I would go so far as to suggest that even if you only have 3 or 4 cucumbers at the moment, it would be worth using them all up for this recipe. I promise you, it’s not that much of a gamble. These are really, very good.If you don’t believe me, believe Julia Child. It’s her recipe. And she is nothing if not reliable. I automatically assume that you’re skeptical about baking cucumber, because I was the first time I made this. My skepticism reached its pinnacle when I got to the end of the recipe and it said, “Bake for one hour.” ONE HOUR. AT 400 DEGREES. A vegetable which I could honestly say I’ve never eaten at warmer than room temp. I doubted Julia. I’m so ashamed. Well, since we’re here talking about baked cucumbers, you know how it turned out. These are wonderful and unexpected and really delicious. 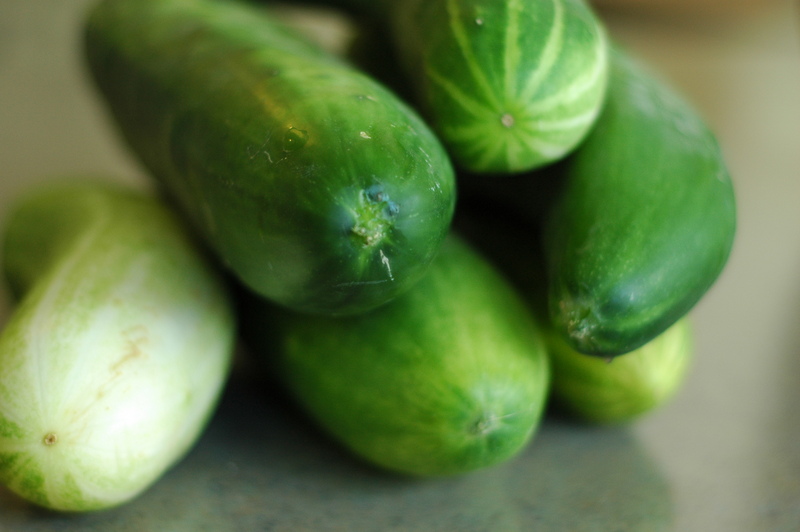 Your instinct tells you that because cucumbers have such a high water content that they will turn to mush in minutes. But a quick toss in a salty solution draws the water out initially, before baking, so that they remain crisp tender, but also melt in your mouth. See. It’s weird. In a good way. 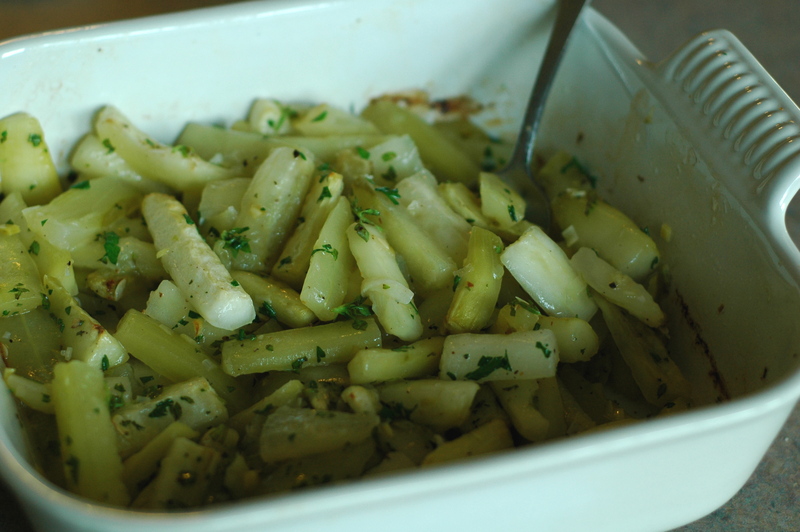 I adapted the recipe a bit to use fresh herbs, which are especially nice against the sweet, fresh garden cukes. But I’ve also very successfully used dried dill in the past. Julia offers suggestions of cream sauce, etc. after they come out of the oven, but I like them just as they are; the bright cucumber flavor with only a slight richness from the butter sauce is just perfect on its own. 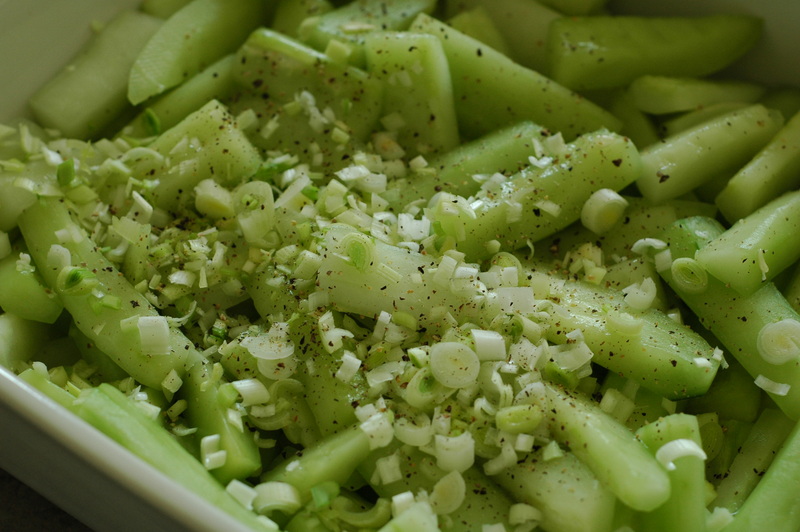 So even though this is great when you have more cucumbers than you know what to do with, I would make this if it meant using my last few cukes of the summer. 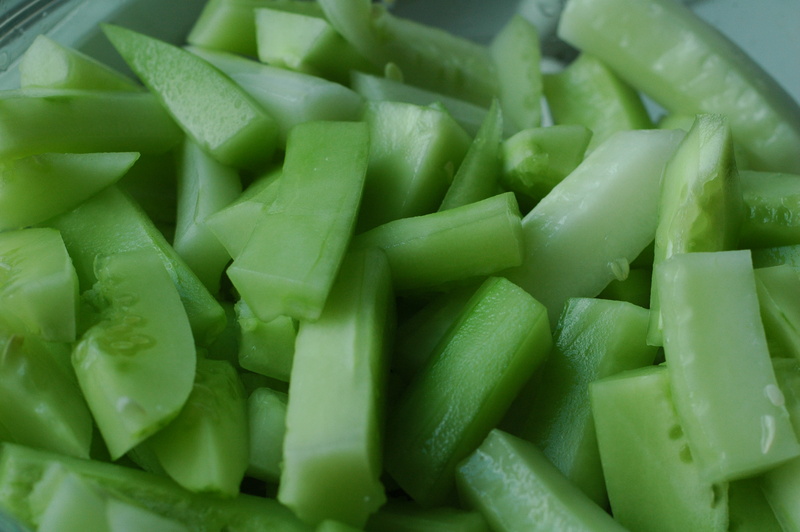 Peel the cucumbers and slice them in half lengthwise and scoop out the seeds with a spoon. Cut into lengthwise strips about 3/8 inch wide . Cut strips into 2 inch pieces. Toss the cucumber in a bow with the vinegar, salt and sugar and let it sit for at least half an hour (but up to a few hours). Drain and pat dry in a towel. 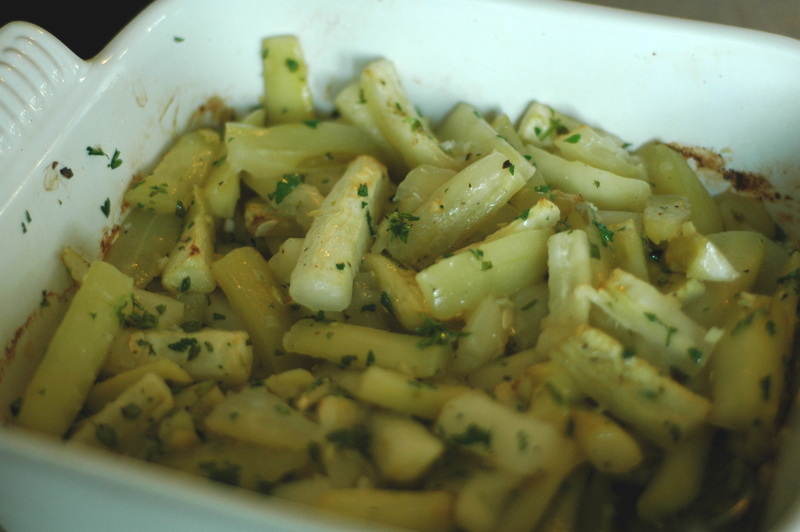 Toss the cucumbers in a baking dish with the butter, scallions, and pepper. Bake uncovered in the middle level of the preheated oven for about an hour, tossing once or twice (or not, if you’re lazy and forgot like I did), until cucumbers are tender, but still crisp and tender. Remove from oven and stir in chopped herbs. Serve immediately. Christina I loved this recipe! Can’t wait to make it, especially since I have 5 very large cucumbers on my table now! And I love the way you write, very creative, you should pursue being a copy writer. Any recipes for tomatillo other than salsa verde? Hey, Donna! You’ll love it; especially if you’re getting cucumbered-out like we are! 🙂 I don’t have lots of recipes for tomatillos, but I’ve had my eye on this one for a while. Let me know how it is if you try it!